I’ve observed comics fans lament, convulse, and conspire against DC Comics’ reboot that is now in week 3. A few fans have secretly admitted anticipating titles, although that group is still in the metaphorical comics closet for fear of revocation of their Geek Card. If the comics investors and price gouging ebayers are factored out, the number of people who are picking up titles is larger –– much larger in fact –– than comics shops and fan boy forums led anyone to believe, as described in a recent Newsarama article. Someone is buying the comics and enjoying them, even waiting for second or third printings. For The Graphic Classroom reader, the controversies hold less import than for mainstream comicdom. We are concerned with how comics –– new, old, and renewed –– can be used in the classroom and to enhance student learning. I have advocated for teachers to grab onto DC’s move and hold tight. 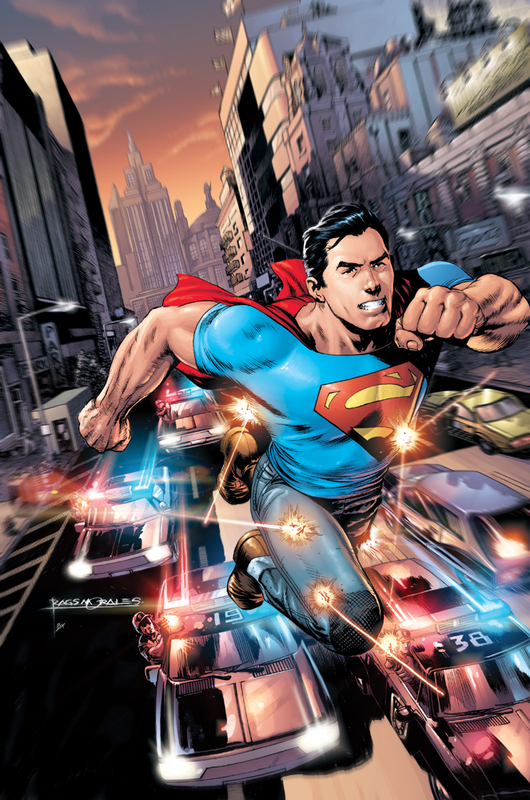 Number ones make for a great place to introduce iconic characters to a generation who may be familiar with an icon through television, movies and toys, but haven’t read a single dialogue bubble or narration box about Superman or Batman. ACTION COMICS #1 introduces the reader to a Metropolis that just recently discovered Superman. The Boy Scout is anything but. He is full of young adult angst and is concerned with information gathered by any means necessary to defeat the bad guys and less concerned about the methodology used to obtain his goal. ACTION gives us the less mature, more passionate Superman than the one we might be more accustomed to. This younger Superman is clearly driven by social justice and the need to do right, but the larger issue of methodology is obviously too philosophical for him at the outset. This makes for an engaging read in light of today’s political, religious and cultural environment and would be a good choice for young persons to make text-to-world connections and analyze the literary themes and how they apply to modern life. I can see ACTION being used in many classroom settings. The obvious English Lit class comes to mind. However, I think any class that analyzes war, politics, or modern society and culture could find a use for ACTION. 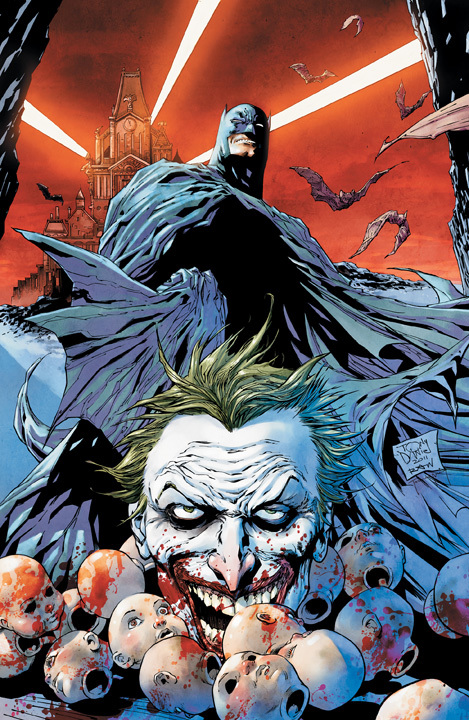 DETECTIVE COMICS #1’s illustrations really stood out to me. Batman’s look is thick and thuggish, like a boxer turned superhero. His neck, forearms, wrists, fingers and ankles are formidable and dominating. It makes him terrifying albeit a bit less acrobatic. Seeing how he is sans super powers, Batman is covered in body armor: shin guards, forearm gauntlets, and knuckle pads that make his human aspects bleed through. I like it. Physically, the armor gives Batman protection from the beasts on the outside. Metaphorically, it says a lot about the haunts on the inside. DETECTIVE is gritty, of course, which is conveyed twice on the front cover: The first with the erosion of the bat and the second with the font used. The entire book maintains the dark feel from story to art. One character has a mask made of human skin. Well, I assume it’s human skin, anyway. It was a nice touch, even if it’s been done before. My only complaint about the art would be the design of the bat computer. Enough with the 70s nostalgia. A new comic should have spent more time on background design. I think DC would have been smart to hire Apple to lend a hand in the concept designs of his cave tech and Batmobile. I think the story will be strong as it continues. I’ve always found Batman to be more focused on the very seedy or downtrodden parts of humanity as well as a great psychology study about the power of life trauma. Sociologists could have fun examining him and the interactions between society and Bat-Bruce. Students could examine how past incidents –– good or bad –– have influenced their life path and how those incidents continue to impact their decisions. Students might also benefit from examining the public me versus the private me and the interplay between the two. 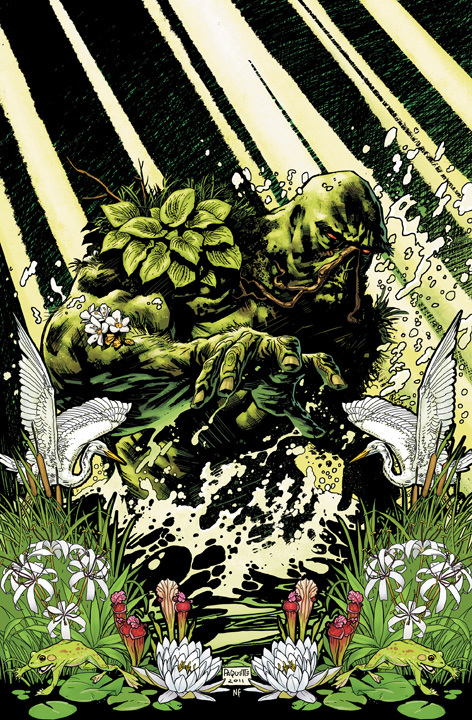 SWAMP THING #1 didn’t really feel like a #1 issue to me. New-to-SWAMP THING readers (like myself) will probably feel like they are missing all the information, or that they came into the story in the middle of the narrative. The art is cool and we may find that SWAMP THING really takes off after a few issues. The idea of the creature hidden inside is worth investigating. 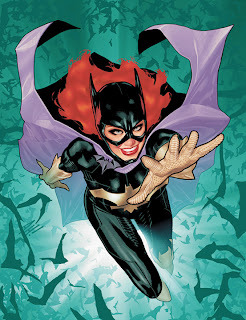 BATGIRL #1 meets a great menace –– The Mirror –– who is out to destroy all the characters on his list. I instantly made a text-to-world connection with the movie Kill Bill when in the opening sequence The Mirror checked his To-Kill list. The compelling storyline is the fact that Barbara Gordon was shot by The Joker three years ago, causing a severe spinal cord injury, whereby Gordon used a wheelchair for mobility. Now magically healed by some “miracle” she takes back the mantle of the bat. Along with the bat, she also carries a severe case of Post Traumatic Stress Disorder (PTSD). At one point a villain pointed a gun at her gut and she froze from the fear of getting shot and paralyzed again. He got away and it was her fault. Barbara Gordon: “She doesn’t mean anything by it. I know she doesn’t. She doesn’t know what it’s like, what the chair helps you do. And I guess I don’t feel like explaining that to her able-bodied-but-well-intentioned-self right now. I have often praised Simone’s writing at The Graphic Classroom. She continues to surprise and delight me. Her upfront treatment of this disability stereotype gives me hope that BATGIRL will be a title that will continue to deal with disability in a reflective and intelligent way while giving students and teachers the powerful narrative we have come to expect from the BATGIRL line. Revised Justice League #1 cover art with Wonder Woman as a super model as opposed to a warrior. Oh well. 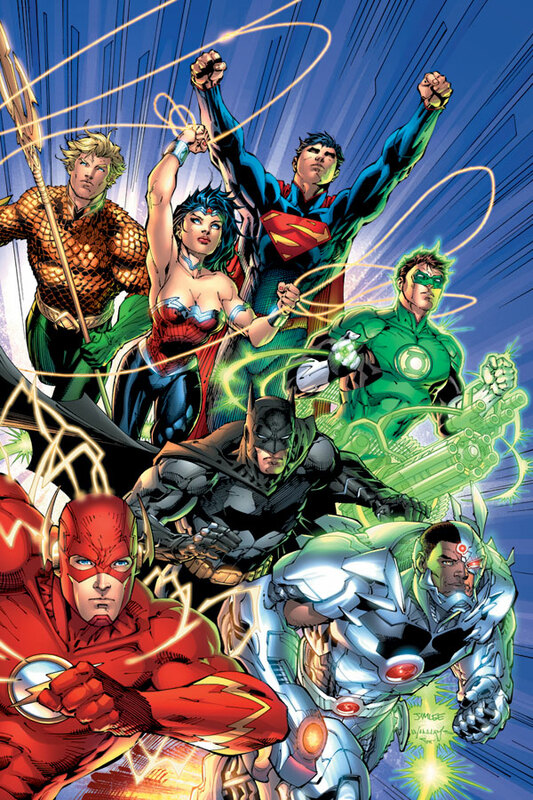 JUSTICE LEAGUE #1 begins where the supers meet one another for the first time. It is the lynchpin for the other titles, but it did little to hook me and make me want to read further. 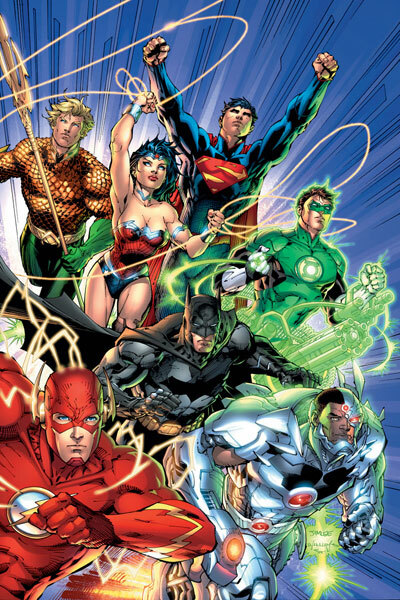 It may be that JUSTICE is just more epic in scope and needs more time to develop into a powerful story. I do believe in patience and giving an author a chance to develop the characters and story. I did find a nugget in the Batman-Green Lantern exchange where Green thumbed his nose at Batman for not being a real super-powered hero like the others. I found it a perfect analogy to the current educational debate between intellectuals and anti-intellectuals. I think a high school classroom could have an excellent debate about education, intellectualism and working-class society. Justice League #1 original cover art with Wonder Woman's pants. I must say, I preferred Wonder Woman's initial costume with the pants rather than the swimsuit look she has now. I think it's more modern and gives her more of a warrior look rather than a swimsuit model. Stay tuned. Next time I will examine the educational aspects of some other DC #1’s, including some more mature-oriented titles.